The Truth About Islam, Facts About Islam. 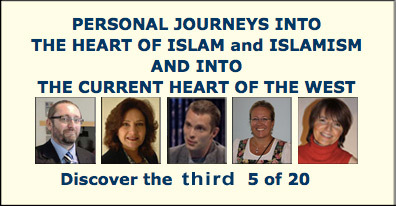 Personal Journeys Toward Understanding Islam and the West, Muslim Beliefs, Islam Beliefs, Anti Islam. Click on any of the faces for info on the person. You also have the option of buying any of the interviews. 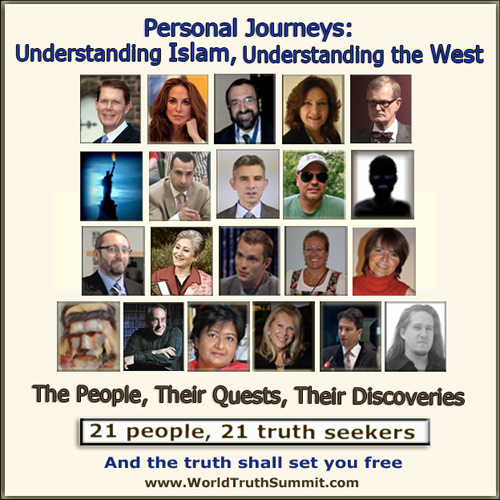 The first interview series: the personal stories and the findings of 21 people exploring what's happening with Islam in the West. 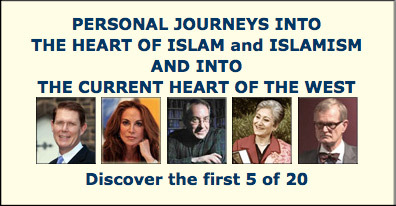 Well-known people like Robert Spencer and Pamela Geller. Local heroes like Majed El Shafie and Freedom Annie. These are explorers on journeys they haven't chosen, journeys they set out on because of some unexpected trigger - from the devastating loss of 100 friends in the World Trade Center, to curiosity about how Islamic religious texts compare with the Biblical stories. In a way, they're like the hobbits living in the Shire. Only there has been no Gandalf who came pounding into a friendly village and warned Frodo and his friends. Instead, the explorers started on their journeys from all around the world, and almost all set out alone, unexpectedly, on their voyage of discovery. What's in the Qur'an? No one told them. No one warned them. And what about the other Islamic religious texts, the Sira and the Hadiths? What's the history of Islam? Is this a religion of peace? And what does peace mean in Islam? Some had an idea from earlier encounters with Islam. Some had an idea as they were Muslim. But being Muslim didn't mean they knew much. Also, Islam doesn't encourage questioning. What are Islamic beliefs, many of the explorers asked, one after the other? What is jihad? Why are there, throughout history, so many Islamic jihad attacks? And what about the current Muslim persecution of non-Muslims, so that over 100,000 Christians are murdered annually for being Christian by Muslims? And what about the murder of Muslims by Muslims? - currently there are about 25,000 such murders a year. And what about all those fatwas? Death threats. Murders and attempted murders. Not all looked at the same questions. Some looked at culture, did not want to look at religion. Some did not want to look at the Qur'an, or found ways of not accepting passages calling for violence to non-Muslims, etc. But wherever they started, for virtually all (not all) of those searching, if they went through the Qur'an, many of the findings have been the same. The Qur'an - it contains passages calling for the death of infidels and apostates. It contains a mass of Jew-hatred. In life, there is no equality between women and men - though there is after death, on judgement day (when women will be judged for their obedience to men). Bill Warner added up the number of those killed in Islamic jihad: 270,000,000 non-Muslims - so-called infidels, kafirs - killed by Muslims in Islamic conquest, acting in accord with a mass of Islamic religious texts.All the explorers have also discovered very hard truths about what is happening in the West around Islam. Political correctn ess, meaning the denial of their findings, and name-calling instead of ready listening to their warnings. It's as if they were Gandalf - but instead of meeting Frodo, they meet ... the three most famous monkeys: Hear No Evil, See No Evil, Say No Evil. Over and over, their words have fallen, not only on deaf ears, but on hostile ears. But the explorers haven't fallen silent. What can we do, if we believe in universal human rights like freedom of speech, the equality of men and women, and also gay rights? What if we believe in democracy? - only to meet up with support for Sharia law, which holds it has the immutable answer for all people for all time? Sharia law - in which a woman's word is worth half a man's - which contains rules for the beating of wives - in which no punishment is demanded for the killing of one's child. Death to apostates. On and on. What do we do in the West, faced with Islamic pressure for blasphemy laws that would prohibit freedom of speech around Islam, telling the truth about Islam? What do we do in the West, where there is almost no recognition that, while Islam is calling for blasphemy laws to prohibit criticism of Islam, Islamic religious texts blaspheme against the Bible? When there is almost no recognition of the amount of Jew hatred in the Qur'an? - so that 9% of the Qur'an is devoted to Jew-hatred. What do we do in the West? Good question. Many are trying to find the best answer. What do we do with Western governments which cave in to Islamic pressure? Which permit huge Muslim immigration with no looking into what it means, to permit huge numbers of immigrants who believe in a religion which is against democracy and for the establishment of a worldwide caliphate with Sharia Law? Most in the West don't have any idea what a caliphate is. A new kind of cauliflower? Perhaps most, what do we do with the politically correct, who so often are venomous against anyone speaking up for freedom of speech, anyone who cares for universal human rights? The politically correct - instead of caring about individual freedom, they so often victimize in the name of those who cry victim. "We are the good guys," the explorers cry, as they try to be heard over the politically correct and the Islamic voices that do the same kind of name-calling. "Look, we're the good guys," the explorers try again, "We're the knights in white trying to save Lady Liberty." The explorers try different strategies to safeguard what they value. Some are trying to get information out on what's in the Islamic religious texts. Some are working to protect freedoms by focusing on government interventions. Some are working in NGO's - non-governmental organizations. Some work to try to protect those persecuted for being non-Muslim. And some are promoting an Islam which is for democracy, the equality of men and women, gay rights - an Islam which is for the separation of religion and state. They publish, they speak, they post videos, they hold meetings. Some speak out using their own names. Others use an alias. The hope: that in country after country, more and more people are listening. In fact, the hope is that, in country after country, enough people are not only hearing the cries of the explorers, but listening to what they have to say. A quote I've heard over and over is, "The truth shall set you free." 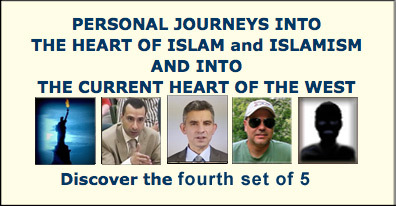 This teleseminar series features interviews with people who have made major contributions toward a factual understanding of Islam - meaning, they have cared and dared to really look into the Qu'ran and Islam. They have also had to face facts about the West. And they have acted to increase awareness and to protect human rights, like the right to freedom of speech, like our right to flourish. The focus, though, is on personal journeys toward difficult truths. As for me, I didn't know whom I would meet. I knew a little about their viewpoints. But who were these people? 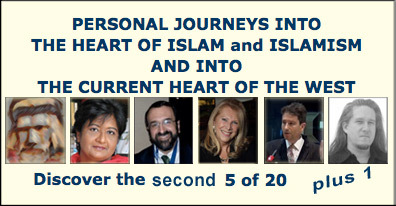 What were their journeys? I had no idea. Are they, for instance, racist Islamophobes? Who were they before they became interested in Islam? How did they become interested? What were major turning points in their interest? How has their interest affected their lives? Have they had to deal with death threats? Have they had to deal with fear? what is widely seen as "the facts." How do we best get heard? the right to safety, etc? and in the further future? In many ways, their stories are ours. Most of us have somehow come to learn about Islam. Very often, we've found out that the Qur'an-based oppression of women and so on were widely held to be acceptable. If we've disagreed, we've perhaps been put down as intolerant, have often had to face fears, often feel unheard. And frequently we've wanted to do something, but found it hard to know what might be effective. Maybe together we can get things to change. The Truth About Islam, Facts About Islam. to more on hidden forbidden knowledge, click here.